Information: There were two Gatchaman cards included in this set, however, the other one was marked as a "Gatchaman" card. To see it, click here. 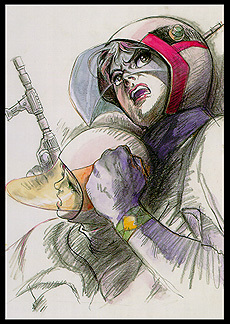 The card on this page is a recycled image from one of the "Gatchaman II" LaserDisc jackets. It was illustrated by Ippei Kuri. The cards were packaged in a resealable plastic bag. A special trading card premium was offered to buyers of these postcards. For each set purchased, the buyer would receive one sealed Tatsunoko Heroine trading card. For more information and images, click here.